Today, the Mansfield, Ohio, News Journal carries the obituary of Betty Curtner, a longstanding member of the Grace Brethren Church in Lexington, Ohio. Readers of the BMH Editor’s Blog may remember she was featured in 2007, when at age 89 she signed up to take a class on Prayer and Counseling for Women at Equip07, the annual conference of the Fellowship of Grace Brethren Churches. She wanted to be better prepared to lead Bible studies for younger women. Read the complete post here. LEXINGTON: In 1942 a self-motivated and strong willed Betty Curtner walked into an Army recruiting office ready to serve her country. During WWII Betty served in the European Theater in Algiers working in the central postal directory for the Mediterranean Command. While in Algiers, Betty was one of three women sworn into the Women’s Army Corps. by General Dwight D. Eisenhower. 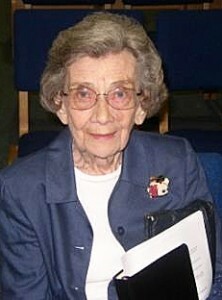 On Sunday March 14, 2010, Betty C. Curtner, 92, of Lexington passed away in Mansfield MedCentral Hospital. Born October 23, 1917 in St. Paris, Ohio Betty was the daughter of Howard and Bessie (Graves) Jenks. So sorry to hear of Betty's passing. she was always a joy to talk to wherever I met her . Accept our deepest sympathy.